When do they stop growing?? He's only four months and already he can stand up and open doors in the house I'm only 5f 1" and when he jumps up he nearly knocks me down his head is up to my chin when he jumps up. He's getting to big for the house so i bought him a kennel but he will not stay in it at night i have to small kids 2yr and 4yr im afraid he will knock them down and hurt them?? Traditionally German Shepherds grow for quite a while. As far as height goes you can usually expect them to reach adult height by around 11 - 13 months, howeverrrrrr, they will continue to "fill out" for some time to come. 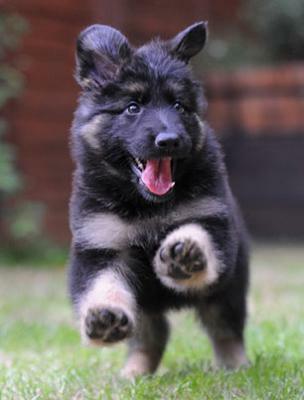 Female GSDs fill out until they're about 2 years old or so, and for males, closer to 3. So, you can easily expect your GSD puppy to grow for a while. Good luck! Comments for When do german shepards stop growing? Your dog is a certified rescue dog? Did you buy it this way? I have been training mine for months and to get certified takes thousands of hours. after reading all these comments im starting to wonder if maybe my GSD is a new breed she is 3 yrs old active happy a good good eater , (she will eat everything and anything if i let her ) and except for that terrible jumping habit (she can jump way past my head and if im not careful she can and will jump on me as high as her back feet landing on my shoulders ) but she weighs no where near any of these dogs and she is little in comparison, she is a certified fugitive recovery K-9 and is in SAR training but even there she is the oldest and the smallest is this a phenom? i dont know maybe some one can answer this for me , but her size has nothing to do with her smarts and heart her loyalty and her courage , i love my GSD . My girl is almost 6 and I think she didn't completely fill out til last year. Her coat is thicker and she just gets prettier. A truly wonderful gentle dog. Don't give up. My dog was so active for the first year I thought she would never settle down,but she has become the best dog I have ever had. They seem to grow forever! Your healthy German Shepherd will grow for while and that's a fact. My boy just turned 2, I'm 5'6 1/2" and he can put his big head on my shoulders (if he wanted to, but he doesn't!) He's busy kissing me in the eyes and head, for some insane reason, and believe me, he can reach! He's NOT 26 inches at the whithers, he's 30 inches at the whithers and weighs 85 lbs. My vet says "Oh, he's still a puppy yet and has more growing to do." while he chuckles at my 'puppy's antics in the clinic. I'm glad somebody finds this funny. That is, it's funny until he eats one of the clinic cats, which he eyes intently. He has his own cat at home, but other cats are more interesting. Everywhere we go I get "That's a BIGGG dog>" It's like I haven't noticed. I can't understand it since I have to fight with him to get him to eat. He was never greedy. In fact, his cat eats from his food bowl even though he has to stand on his hind legs to reach it, and does this while my dog is eating. I have a picture of them eating from the same bowl together. At your height of 5'1 your puppy will be that tall before he's 1 year old, so get prepared to look up at him now. Just remember, teach him not to jump up on you or your children while he's still young, do not wait and good luck. 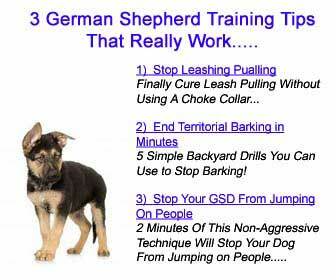 First let me say I was interested about how long the German Shepherds grow too and I found the information very useful. In reference to the puppy at 4 months jumping, etc. German Shepherds are an active bred and I found when my fellow was young the more activity we did with him helped. We found that puppy classes and the interaction of other dogs also made him tired and he would rest. We all think the puppies are like babies and sleep and eat, but they mature at a faster rate, as my trainer explained, soooooo they need more activity and they need to learn who is the boss. I believe the jumping is another way of saying please play w/me here I am. My guy has finally settled down, in fact if we meet small dogs he will lay down and play w/them, now I just have to remind him his feet are big and heavy and to be "gentle". Dogs are, and especially shepherds pack animals and I can understand a puppy or any dog not wanting to be alone. Have you tried crating him in a bedroom with people around? The crate will become a home for him and he will go there when he wants to just have 'his time'. The crate will make way to run of the house I am sure, but it can help and also help for teaching him his rules, just as you would put a child in a time out. I work with a rescue and please don't give up on your puppy because he is being a puppy. I have seen this happen before. However, remember if all else fails, that's training, crate, etc. remember the rescues are the best way to go. Good luck and I hope you will be able to write something like this with the same title for someone else in about 8 months. Remember German Shepherds are wonderful family pets and loyal friends. They want to be a family member.